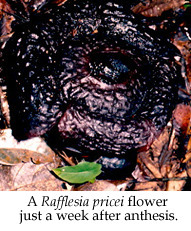 " a penetrating smell more repulsive than any buffalo carcass in an advanced stage of decomposition" (Mjoberg, 1928) There are approximately 17 Rafflesia species distributed throughout Southeast Asia (Nais, 2000; Meijer, 1997; Mat Salleh, 1991). These species are highly specific as to the hosts that they parasitize, preferring only a few species of Tetrastigma (a member of the common grape family) that are distributed in the same geographic area. Although technically a member of the plant kingdom, Rafflesia challenges traditional definitions of what a plant is because they lack chlorophyll and are therefore incapable of photosynthesis (as are all members of its family, Rafflesiaceae). 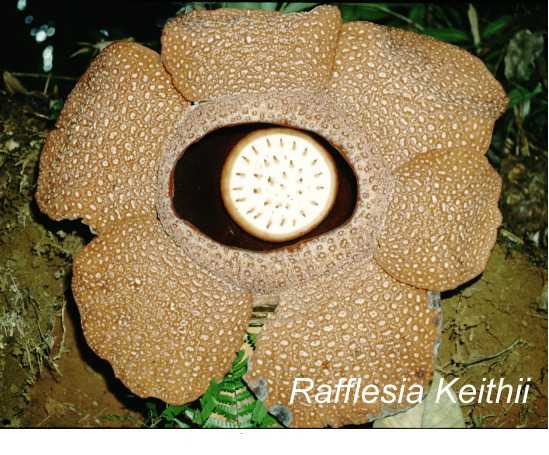 While many parasites appear like normal plants, Rafflesia lacks any observable leaves, roots, or even stems (Meijer, 1993). Likened to fungi, Rafflesia individuals grow as thread-like strands of tissue completely embedded within and in intimate contact with surrounding host cells from which nutrients and water are obtained (Mat Salleh, 1996). Perhaps the only part of Rafflesia that is identifiable as distinctly plant-like are the flowers; however, even these are bizarre because they attain massive proportions (up to 3 ft in diameter) and are usually reddish-brown and stink of rotting flesh.. Although parasitic, Rafflesia species do not typically kill their hosts in spite of the drain on resources that they cause. 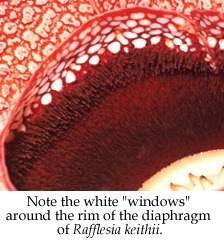 Pollination in Rafflesia has been studied (Beaman et al., 1988) but is likely a rare event due to the several factors. The flowers are unisexual and single sites usually produce either male or female flowers (see exception below). Therefore, in order to have effective pollination (reproduction), male flowers must be in close proximity to, and open at the same time as female flowers so that flies (or any other insect) can transfer pollen. While male and female individuals could be closely spaced, flower bud mortality is 80-90 % per site thereby reducing the chance of co-flowering of two individuals (Nais, 2000). Furthermore, flower lifespan is only 5-7 days thereby placing a temporal bottleneck on the process of pollination (Beaman et al., 1988; Nais, 2000). To complicate matters further, current population distributions are fragmented due to habitat destruction. Thus, successful sexual reproduction relies on the unlikely event that a male and a female would bloom during the same 5-7 days and that a fly could carry pollen between the often widely separated populations. 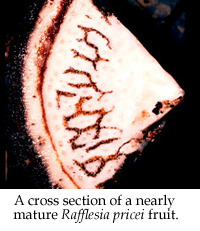 There are several reasons Rafflesia has remained difficult to study for the 180 years since its discovery. First, individuals grow entirely embedded within the body of the host plant that they parasitize (Kuijt, 1969). 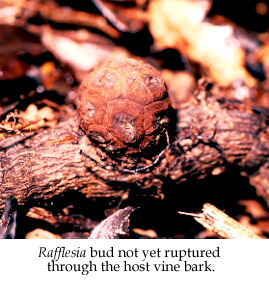 As such, Rafflesia individuals are only visible when they erupt from within the host body as a flower bud. 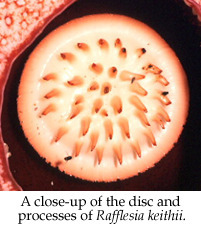 Although traditional means of studying Rafflesia, like anatomical sectioning, could be performed, this method would likely result in death of both the host and parasite. 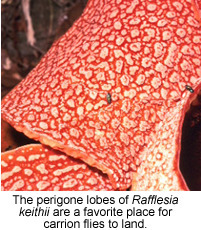 Second, Rafflesia is rare in occurrence and can only be found in relatively remote lowland forests of Southeast Asia. In this region, much of its habitat has been converted to farm land or timber concessions and in some parts of its range, the buds are harvested and sold for their purported medicinal qualities. Third, even once Rafflesia individuals become visible as flowers, these only survive a few days before decomposing. All of these factors make it difficult to even find Rafflesia sites and even when they are known, the sites are often not protected so there is no guarantee that they will exist in subsequent years. 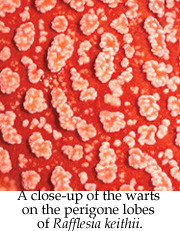 Unlike other parasites that are important to study due to the economic loss they cause to important crops, Rafflesia causes economic benefit through ecotourism: thousands of people go to Sabah (Malaysian, Borneo) annually hoping to see Rafflesia blooms (Nais & Wilcock, 1998). For this reason, there is great interest in conserving Rafflesia sites rather than eradicating existing populations (as is the case for noxious parasitic plant weeds). Although preserving as much of its habitat as possible would be the simplest and most obvious way to conserve Rafflesia, this is not currently practical throughout its range. Therefore, there is a need to investigate key questions that will establish priorities for ex situ (not natural habitat) propagation (which is only recently possible for the first time in history [Nais & Wilcock, 1999]), management of currently protected sites and procurement of unprotected sites, and in situ (within natural habitat) breeding programs.